This is Cedar Key, right? It's not supposed to get that cold is it? I woke up around 7 am and it was just hitting 35 degrees. Wait a minute.....are we still in Campbellsville, or are we really at Sunset Isle RV Park.......were the last 3 days just a cruel, doggone teasing dream? I looked outside to be sure where I was, and sure enough I could see the water of Cedar Key across from our site. I guess Sunday we were still catching the rear end of the front that passed through two nights ago. The plus to the start of this unusually cold day was that it was sunny, and there were no clouds. We didn't have much time to set up when we arrived Saturday so I got busy draining the gray tank so we could take showers, and then we unhooked for a few minutes so I could re-position our coach in the site so we had a better view of the water, and could deploy our awning....there was a tall pole in the way. Once that was done I connected everything again, and then put out our awning mat, and eventually got our LED lights put out again.....now it feels like home again! 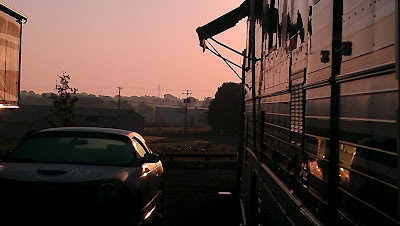 Later when it warmed up a little we took the top off the T'Bird, and stowed it in the trailer. We know there are some warm days coming when it will be nice to put the top down. We haven't had it down since early November when we drove over to Maker's Mark Bourbon for the distillery tour. Naturally, it was NFL day so a few football games were playing in the background as we continued to get our camp organized. It will probably take a few more days to deploy all the stuff that makes this feel even more like home. Around 2:30 pm we decided, on the recommendation of our good friend, David Zonker, who was here just a few weeks ago, to go to an early dinner at Tony's Seafood Restaurant and have some of their world famous clam chowder. They are world famous because their chowder has won the world championship 3 times in a row. I'm not a big shellfish fan, but this clam chowder was amazing. We each only got a cup to go along with a fish of the day sandwich, but it was stunningly good, and we cherished every bite. I will get a bowl the next time for sure. We arrived back "home" just in time to see that our friends Chris and Cherie (Tales from Technomadia) had arrived, and were beginning to figure out how to get their 35' long, 1961 GM 4106 vintage bus conversion into site #6, directly across from us, but right on the water. It took a few passes to get the the right angle, but Chris, with Cherie's help on the walkie talkie, maneuvered their coach into the site. After the successful parking venture we exchanged hugs as Bill and Debby Kasson (Bill and Debby's Wild Ride) came up. Our Nomad reunion from last year at Cedar Key is starting to come together. We stood and talked for a while and then Bill suggested we needed to get ourselves over to the Low Key Hideaway Tiki Bar in time for sunset.........we all immediately retreated to our "homes" to change clothes and walk over......it's only 150 yards away....how cool is that to have a great local bar that close? TLE and I got there just after Bill and Debby, Chris and Cherie followed in short order, we ordered a couple of Glenlivet 12 year old scotch's on the rocks for ourselves, and then settled in to watch the sun set. Nothing like a good aged Scotch and a beautiful sunset to cap off a great day 2 in Cedar Key! There were a number of people out on the dock talking, but as the sun sank, and the horizon turned a glowing red all talk stopped, and just stood there in the moment enjoying the stunning beauty of what we were witness to. We took a few more pictures, finished our drinks, and then headed back home feeling satisfied, and very mellow. I think we have adjusted to Cedar Key time. We have no appointments, no obligations, just time to ponder, relax, spend time with friends, and soak up the Cedar Key vibe. 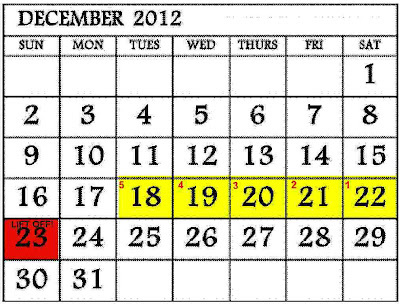 Monday, December 31st marks the end of our 11th month on the road, and the best is yet to come! If you saw the movie "Field of Dreams" you will remember the scene where Shoeless Joe Jackson asks Kevin Costner "Is this Heaven?" and Kevin replies"No, it's Iowa". Cedar Key seems like Heaven to me, but it is really "just" Cedar Key, FL. I'm pretty sure Heaven and Cedar Key must share a similar latitude and longitude. As you pull into the entrance at Sunset Isle RV Park you immediately see a sign proclaiming "Welcome Home"......to me it feels more like Heaven than Home, because, after all, we brought our home with us. It rained virtually all night long at the Walmart in Macon, GA, but by the time I got up at 6:30 am it had stopped, but was still heavily overcast. I immediately turned on all 3 gas heaters, and then the generator so I could make the coffee.....yep, I'm lazy sometimes, and just don't want to wait for the coffee to "percolate" on the stove. Anyway, I needed to pre-heat the Detroit Diesel so it would easily start when we left in a couple of hours. While the coffee was being made I started to work on the last blog entry. By the time the coffee was ready, the blog was done, and uploaded. TLE arose a little after 7 am, and we were on our way south by 9 am. Our tentative goal for the day was Cedar Key, some 303 miles to the south....about half that distance on I-75, and the other half on secondary roads. Our reservation on Sunset Isle RV Park starts December 30th, but I was sure we could arrive a day early and find site D unoccupied. As we made our way south it got dry, and the sun came out. We decided to take several rest stops this day to make up for almost 5 hours without a stop the day before. Our first Rest Area was less than 50 miles into the day, and our second was another 60 miles, and our 3rd was another 50 miles as we exited I-75 to continue our trip on secondary roads into Florida. We finally crossed the border into Florida at precisely 12:40 pm. It seemed as if the clouds parted, and for the first time in a couple of weeks we saw the sun, and felt its warmth. The secondary roads in Florida are way better than in Georgia, and 1000% better than those in Kentucky and Tennesse. The main difference being that the lanes in Florida are actually a couple of feet wider than our coach, and just 6 inches wider in Kentucky, Tennessee and Georgia. Much more relaxing when you have a couple of feet to spare. We hit Perry, FL (you will remember we stopped overnight in Perry last March on our way south to Cedar Key). We took a rest stop at the local Walmart, and we were finally able to break out the flip flops and shorts again. I haven't worn flip flops since October. From Perry it was another 98 miles to Cedar Key, and we decided right then that we would go all the way to Cedar Key this Saturday. I called ahead to Sunset Isle and was informed that our site was available for occupation, so the race was on. We hit Chiefland around 3:30, and stocked up on groceries before we drove the last 31 miles to Cedar Key. There is a small store in town but we wanted to make sure we have the big ticket items. We wanted to get to Cedar Key in time to walk over to the Tiki Bar for the sunset, drinks and pizza, and we made it just a few minutes before 5 pm, and were in our site by 5:30. We had to drop the trailer out front where a few boats are parked, because site D is not quite long enough for the coach and trailer by about 5 feet. Once we got the coach plugged in, and the water connected we changed clothes and headed over to the Tiki Bar to celebrate. The sunset was spectacular as always. We made a lot of stops today, but in the end we arrived in Cedar Key fresh, and not worn down like yesterday evening. We will be here until January 31st....our one year anniversary of living life on the road.....looking forward to sitting still in such a wonderful place like Cedar Key, or Heaven, if you will. Looking forward to the arrival of the rest of the Nomadic NuRVers over the next few days! Friday has less meaning when your job is moving your motorcoach every few days.....then Friday is just like every other day.....only better.....it always feels like the weekend....except when you are working at Amazon and it only means one more 12 hour day before you're off for two days. The only other time Friday has more meaning than any other day in this lifestyle is when you are driving through a major metropolitan area near rush hour, or it's the Friday after Christmas and everyone is driving back to where they came from all day long causing the Interstate to come to a stop in the middle of no where. The day started out with us moving the coach over to Choo Choo Express Garage to be serviced by Joel, our mechanic. Joel did a safety inspection of all the running gear, lubed the running gear, serviced the transmission, changed its filter, changed the engine oil, change its filter, and replaced the two fuel filters. I had budgeted $1,500 just in case Joel found something serious that needed to be addressed. As it turned out we still have over 60% on the brake linings, the front end is in good shape, except for a minor adjustment on the Pittman Arm linkage. The transmission fluid looked brand new to Joel, and he thought we had serviced it very recently. I told him I didn't know when it was last serviced, and that I hadn't had it serviced since I bought the coach in March of 2008. Once he got to filter he knew I was right....it was a booger to get off, but off it came. We have been using Rotella T 40 weight (single weight) since we bought the coach, and so had the prior two owners. Don, the owner, recommended switching over to Delo 400 (a Chevron product) 40 weight, and so we took his recommendation. It took about 5-6 gallons to fill the crankcase, and refill our oil reservoir. The oil was the most expensive single part of our service costing close to $170. It took around 3.5 hours for the service....we were only charged for 3 hours of labor at $55 per hour. So with labor, oil, filters and lube our total came to only $422.30.......as I wrote out the check it felt like someone had just handed me back $1,100 I had already spent....in my mind that money was gone. Again, that's my nature.....I always assume there's going to be something wrong that is expensive to fix....when will I learn? Of course, the day will come when something really expensive will come along......won't it? Joel says if you service the heck out of these engines they'll run forever. Well, the prior two owners of my coach did exactly that, and I am the beneficiary of their diligence. I am doing my best to continue their tradition. We left Choo Choo, and Rossville, GA around 1 pm heading south on I-75 toward Macon, GA, our destination for the afternoon. The distance was 190 miles.....not a bad drive, normally, on an Interstate....maybe 3.5 hours of driving. Unfortunately, we came upon a 7 car accident about 25 miles south of Rossville that delayed us around 45 minutes.....then just south of Atlanta we hit holiday, and rush hour traffic around 4pm delaying us another 30 minutes, so we finally arrived at the Walmart in Macon, GA around 6pm. This is our second time in this Walmart, and it is one of our favorites. We felt safe here last time, and this time also. 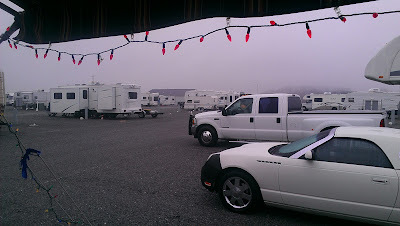 There are several other RV's here in this part of the parking lot, so that also adds to the comfort level. 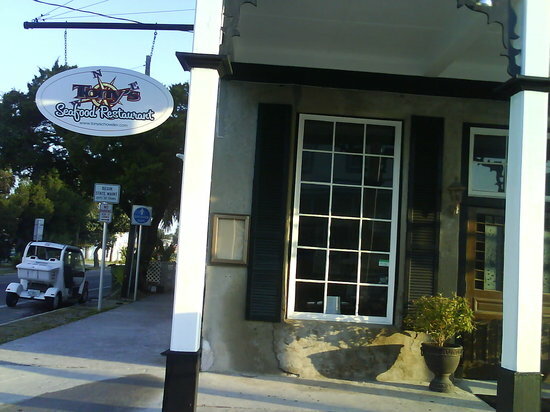 Plus, and a big plus, there are several restaurants within walking distance. I had only had a bowl of cereal, and half a sandwich all day, so I was famished. We quickly changed into street clothes (I wore my pajamas to drive in.....very comfortable! ), and walked across the street to Buffalo Southwest Cafe and ordered a couple of pints of draft beer.....Shock Top for me, and some appetizers. For starters we ordered a plate of Tangled Texas Twists.......homemade potato chips covered with a special cheese sauce, sour cream, jalapenos, and bacon chips.....a very decadent dish for sure! We sat there unwinding, and enjoying the food and draft beer for about 1.5 hours. Afterwards we walked back across the street and did some shopping at Walmart, as we always do when we use their parking lot to overnight. We needed some AAA batteries for our walkie talkies, Kleenex, and milk. Then it was back "home" for the night. I turned on the genset, and set up the satellite dish to watch a bowl game before heading off to slumberland for the night. It was a good day, and even though we ran into delays on our drive south it was really no big deal......after all we have no schedule, or anywhere we HAVE to be, right? So why get stressed over traffic.....it is what it is. And we found out our home is in good working order, safe to drive thousands more miles, and change our view hundreds of times. Today south towards Cedar Key....it's about 300 miles, and we haven't decided 100% that we will go the distance today....we'll just have to see.....I would say it's about a 95% chance we will go to bed in Cedar Key tonight. For the first time in over 11 weeks we woke up somewhere other than Campbellsville, KY.....in fact we woke up 3 states removed from our prior location! It was cold, but DRY! We had arrived at Trav-L-Park after the park office closed, so I walked over about 8am to pay my bill. Sandra agreed to pencil us in for #108 just in case our work did not get finished at Choo Choo Express Garage. Around 8:30 I called Joel at Choo Choo to find out if it was okay to come on over, and he replied that he still had a 45' Prevost sitting over the pit inside the garage waiting for an air bag that was supposed to have arrived Monday (Christmas Eve)....hmmmmm....seems like he is waiting on the same truck Firestone was....:D At any rate he asked very apologetically if we could wait a day, and come in on Thursday instead. When I made our reservations in Cedar Key for the 30th I had given ourselves extra time for the unexpected, and here it was. Of course we can leave as late as Sunday and still get there......it's only 500 miles.....certainly farther than we want to drive in one day, but doable. Our service should take just 2, or 3 hours, so even if it takes all day we'll be out of here Saturday giving us two driving days to get to Cedar Key.....much more to our liking anyway. Just after I got off the phone with Joel I got a text message from a Newell friend (Richard) who was nearby visiting relatives asking if we were up to a short visit.....I immediately called him and asked him to hurry over. This was very serendipitous as we had planned to visit he and his wife during our stay at Amazon, but Rhonda had fallen while trail running and broke her shoulder the day before we were to have left for West Virginia. We were disappointed then of course, but now serendipity had made up for it. We spent an hour catching up with Richard, and he and I also walked over to Choo Choo so he could meet Joel. He may be using his shop in the near future to replace an air bag, or two on his Newell. Choo Choo's shop rates are about 1/2 what other diesel shops charge at $55/hour. They work on a lot of older tour buses, bus conversions and Prevosts.....anything that has a Detroit Diesel 2 stroke engine in it. Since we were free for the day and I needed a haircut we decided to walk 3 miles to the local Supercuts so I could get my ears lowered, and look pretty again. A few months ago TLE would never have consented to walking 6 miles round trip across town, but now that we are both Amazon "hardened" and are used to walking much farther she said "why not? ", so we did. We had to really bundle up as it was still in the mid 30's when we started our 3 mile trek. Surprisingly TLE set a brisk pace that found me having to speed up a little to keep pace. We covered the 3 miles in about 55 minutes. By the time we got there I had stripped off a couple of layers of upper body clothing. There was only one stylist on duty, but I was in her chair within 10 minutes, and we were on our return walk 15 minutes later....we covered the return 3 miles in 50 minutes with me having to up my game further to keep up with TLE who led all the way. What has Amazon created? We arrived back at the coach just before 2pm. We are determined to keep up the conditioning we gained while at Amazon.com, so we will continue to do a lot of walking, mixed in with a suitable amount of bike riding while we are in Cedar Key. We were both still tired from drive down from Kentucky on all those narrow, windy roads....it just kind of drains you mentally especially with all the rain and snow. I watched a couple of college bowl games, and took several naps, and then the sun was going down on another day. TLE made some wonder, and I mean wonderful, lasagna for dinner and I chased that with a Snowdrift Vanilla Porter made by Leinenkugel's out of Milwaukee, Wisconsin. I picked a six pack up at the county line liquor store near Campbellsville out of curiosity. I had never heard of it, but now I have, and it was yummy! I'll be looking more for that one when we get to Cedar Key! We hit the sack (pre-heated by our electric blanket) around 10:30pm.....tomorrow Choo Choo's......hopefully! We got home from the "The Hobbit" Christmas night around 11pm, and it started raining just a few minutes later, and it rained all night long, and was still raining around 8 am Wednesday morning. I still had a short list of things to do before we could put Campbellsville in our review mirror, the most important of which was putting new tires on the trailer. Bill at Firestone promised I would have my new tires by "dinner" Wednesday, so I busied myself with the other stuff......check the inflation of all the tires, which I did. Put away the air compressor and the outdoor fireplace, put away the tire covers, put away the awning mat, go down to the park office and pay for my last 3 days, and take off the mirror and windshield wiper covers. Jim, Sharon, Rich and Pat left around 10 am, and then we were alone. Around 11:30 am I called Firestone and was told the truck had not arrived yet, and they weren't sure when it was coming. I decided to drive over and pick up my wheels, and take them to Taylor County Tire just up the street. I had intended to go there last Saturday, but they weren't open, so I went to Firestone. Ultimately Taylor County Tire had SIX, count them.....SIX, tires in stock, and had two of them installed on my rims in less than 15 minutes. I rushed home and put them on, then it was time to load the T'Bird....of course it rained while I was putting on the new treads, and while we loaded the car, but we got it done, and were on the road by 1:30 pm heading south on Route 55. There was a point in time Wednesday when I thought it might be possible we would spend one more night in Campbellsville, but we surmounted all the odds and escaped the gravitational pull of that fine town. It was raining steadily as we treked southward, and then it turned to snow. We moved a little east and picked up Route 127 and took that south into Tennessee. When we stopped briefly in Crossville, TN it was snowing, there was ice on the windshield, and it was 29 degrees.....we were at 2,000' elevation. I went outside to open the water bay door in order to turn off the electric heater I had left in the "ON" position in error, but the lock on the door was frozen.....I could not insert the key. I had thought about stopping there in the Lowe's parking lot, but the thought of trying to keep warm in those freezing temperatures did not appeal to me, so we pushed on. Finally around 50 miles from Chattanooga we began a slow descent to around 800', and a little warmer temperatures causing the ice/snow to fall off the windshield, and off the roof. We could have taken the Louie B Nunn Parkway out of Columbia over to the Interstate, and then south, but that would have turned a 228 mile day into a 290 mile day, so we stayed on Kentucky and Tennessee back roads.....some rather narrow at times, and arrived in Rossville, GA (a couple of miles from Choo Choo Express Garage) around 7 pm, and are currently plugged in with heaters blazing at Trav-L-Park, a park TLE found on the internet, and it is just perfect.....thank you honey! They had a perfect site for us.....70 feet long, #108. Tomorrow morning we will drive the two miles over to Choo Choo and drop the coach off for its service. So we covered 228 miles in around 5.5 hours, and that is not bad considering how narrow and windy the roads were, and how miserable the weather was all day. I really don't like driving in rain, or snow....who does, right? I hope this is the hardest driving day we will have on our trek south to Cedar Key. It looks like better weather the next few days. Looking forward to warmer temps in Cedar Key, and less need to use electric heaters. Thankfully, Christmas Day was not white. Nevertheless, it was quite cold. I had a lot of tasks to accomplish before we drove into Elizabethtown, KY to eat at the only restaurant apparently open within an hour's drive any direction....Ginza Hibachi....a Benihana type restaurant where the chef cooks your food on a grill right in front of you. At 9 am it was only 32 degrees, but I couldn't wait any longer to start my chores. Five hours did not seem like enough time, and it was not. I didn't get 4 and 5 done, so that will be done in the rain on Wednesday (today) before we leave. Of course I still have to re-install the trailer wheels after I get them back at "dinner time" today, drop the trailer on to the hitch, and load the T'Bird along with the other tasks.....all in the rain, which was forecast at 100% probability, and as I sit here writing it is absolutely raining as it has since midnight.....fun times ahead for sure. It was hard to keep my hands warm even with gloves on as I had to take them off periodically to handle small bolts, nuts, etc. I finished putting the last brake assembly on around 1:55 pm.....it was still only 37 degrees.......we were supposed to leave to drive into Elizabethtown at 2 pm.....who needs more than 5 minutes to get ready for dinner, huh? I guess I do....it took me 10 minutes to clean up, change clothes, and deposit myself in the shotgun seat for the ride into town. We drove our own car as we were going to see "The Hobbit" and wanted to be sure we could leave on our own if dinner went longer than expected. I had this bittersweet feeling sitting there talking and laughing with our friends.....we were having a splendid time as always, but I knew it was our last meal together for the near future. Wednesday Jim, Sharon, Richard, Pat, TLE and I are rolling our wheels south, while Michael and Liz will remain for a few weeks to get their motorhome remodel finished. They will head west to Arizona to meet up with friends late January. We hope to hook up with the rest of the gang later in January at their home town of Zephyrhills, FL, which is not far from Cedar Key. I know we will see Michael and Liz later this year, probably somewhere in the Pacific Northwest, but saying goodbye, nevertheless, is still not my favorite thing. The chef put on a great show, and the food was amazing....I felt a little weak in the knees it was so good. The video above was the typical cooking tools show you get, and he was pretty good. We arrived at the restaurant around 3:10 pm, and departed near 6 pm.....a nice, slow meal. TLE and I said our goodbyes to Michael and Liz (we'll see Jim, Sharon, Richard and Pat Wednesday before they leave) and headed back to Campbellsville to catch "The Hobbit" at the local Green River Cinemas. The showing was in 3D, which made it a little more interesting than normal.....normal being we have loved the previous 3 Lord of the Rings movies by Peter Jackson, and we loved this one, too. It was just shy of 3 hours, and there are two more installments to come, so I know what we'll be doing the next 2 Christmas'. There's a lot more to do before we leave, and I see a small break in the rain coming, so I had better be ready to move quickly to avoid getting drenched. Merry Christmas to one, and to all! MERRY CHRISTMAS FROM THE HOCKWALD'S!!! We find ourselves far from family and many friends on this Christmas Day, but our hearts are full on this day dedicated to the celebration of our Savior's birth. We will miss the hugs, and kisses of children and grandchildren, but we know we are in their hearts, and they in ours. Our connection, though separated by thousands of miles, cannot be severed. And even though we find ourselves far from family and kin, we celebrate this annual remembrance with new friends, with the promise of new adventures lurking just beyond this days' sunset. As I related in yesterday's post, we managed to sleep to a little after 9 am Monday, so it appears we are back to a regular, normal humanoid schedule of going to bed before it is called tomorrow, and getting up when it is still called morning. I called Bill at Firestone Tire around "dinner" time to see if our trailer wheels were ready for pick up, but was advised by Bill that "apparently" the "truck" delivering them was not running as it was Christmas Eve. Hmmmmmm....that would have been good information to have Saturday when I dropped them off....:-/ Well, it is what it is.......the truck is supposed to bring our new trailer tires Wednesday morning.....the day we are supposed to leave for Chattanooga, and as long as I can pick them up at "dinner" time we will still be okay.....it is a little less than 200 miles to Chattanooga, so even if we leave around 1pm we should arrive late afternoon. Meanwhile, back at the "ranch" I finished stowing everything away inside the trailer, and it is now ready to receive the T'Bird. The only things left to do today are check the air pressure on all our tires, install the remaining two brake assemblies, disconnect and stow away the sewer hose, and disconnect the water supply after topping off our fresh water tank. Then all we have to do Wednesday is re-install the two trailer tires, put the car in, and unplug the electrical........and roll the wheels south. We met our Amazon friends, Jim & Sharon, Richard and Pat, Michael and Liz at Creek Side Restaurant out on the north edge of town for Christmas Eve dinner. It was buffet style only, but it was great......real friend chicken in Kentucky, mashed potatoes, corn (among other vegetables), and salad. We shared our various perspectives on our Amazon experience, and it seemed we were pretty much in agreement that we would probably not do it again, but time, as is always the case, will tell. After dinner we retired to Jim and Sharon's coach for spiked egg nog, coffee and apple dumplings. Eventually TLE and I retreated to our coach for the evening and watched the last half of "Little Shop Around the Corner", and then "A Christmas Story". I watched "The Bishop's Wife" earlier in the day. Around 11 pm we went to bed giggling, and with big smiles on our faces.....it was a very nice day, indeed. By Sunday morning Heartland RV Park began to resemble a ghost town......okay, I know "ghost town" is a relative term....so, relatively speaking, Heartland RV Park is taking on the look of an RV ghost town. I can now park our 'Bird right next to our coach. There are only 5 coaches left in our row. Where over 130 coaches parked for up to 3 months just a few days ago only a couple dozen remain, and more leave everyday. Come Wednesday there will be at least 4, or 5 of us leaving, if not more. Soon there will be just a few diehards left.....those who have chosen to remain after Christmas for a few weeks to help with inventory. The rest of us will be headed for home, or continuing our nomadic adventures somewhere else where flip flops, mohca frappuccinos, and cold beer are popular at this time of the year. As I mentioned yesterday we both were awake at 4 am, so we decided to just get up and take a few naps later in the day. Around 6 am I headed out to the trailer to finish putting everything way so we can squeeze the car in tomorrow afternoon in preparation for our lift off Wednesday morning. By 9 am I had gone as far as I could, and was approximately 85% done. There are a few things that must wait on other things being put away before they can be stowed, but that will happen on Monday. Fortunately the weather was clear, and about 10 degrees warmer.....it got up to 45 degrees, which is much, much more conducive to working without gloves part of the time. Around 9 am I went back in the coach and took a nap, and then back out into the cold to continue stowing more stuff away. Around Noon we decided to run into town and do some shopping. I needed new slippers, and pajama bottoms. In addition my micro brew beer supplies have been reduced to zero, so we made a beer run out to the county line and picked up 3 six packs. There is a great store in Cedar Key that maintains a wonderful inventory of craft beer, so I'll worry more about beer when we get to where it is warm enough to drink it. We arrived here October 3rd with about three 6 packs, and apparently I only drank about 6 beers per month the whole time were were here. After the beer run we decided we needed a good cup of coffee so made the run over to Greensburg to Longhunters Coffee, but not before we stopped at the Taylor County Courthouse to take a picture of the mural we had seen each time we drove up Broadway. I would tell TLE each time what a cool painting that was, and this time she said "let's stop and take a picture of it!" , so we did. According to the sign this is a recreation of the Union Army's General George Thomas' march through Campbellsville on January 1st, 1862. Greensburg is about 11 miles west of Campbellville, and, as I have mentioned before, has a very nice old town area where Longhunters is located. We arrived around 12:45 pm, and had a great cup of joe with a bagel. It was so nice to sit and talk about something besides Amazon.com. We arrived back "home" around 1:45 pm and I settled into watch some NFL The Broncos won their 9th in a row, the Giants lost badly again, and are on the edge of missing the playoffs, while the Steelers were officially cut from the playoffs in their 3 point loss to the Bengals. The night cap saw the Seahawks embarrass the 49ers 42-13....and it wasn't even really that close. There were 3, or 4 more naps for each of us.......I think our bodies and minds realize it is now time to start the recovery process. As a result of all the naps we managed to stay up to around midnight this time, and went to bed ready to sleep, and actually slept to 9 am.....I think we are creatures of the day once again! It is very overcast, and a little foggy as I write, and there will be rain right about now, but it should pass by Noon, right about the time I am to drive over to Firestone to get my trailer wheels back with their new shoes. Then I can re-install them and then put the remaining electric break assemblies on the rear axle. That was our unexciting day.....well, there is a little excitement knowing we will be heading south in just a few hours now. Saturday was a very, very, very cold day here in lovely Campbellsville.....a high of 35 was recorded somewhere......it never seemed that warm to me. It seemed that I was always trying to get warm. First my hands were cold, but I couldn't wear gloves all the time because I was handling small wires, and bolts. Then my feet would get cold and I'd have to go inside the coach to warm them up. Around 11 am it was time to take TLE into her hair and massage appointment at Phase 2, an Aveeda Salon. This will mean something to the ladies here, but it means nothing to a guy who has been going to Supercuts for 30 years. After I dropped TLE off to her much deserved spa day I headed over to Firestone to drop off the two wheels. The replacement tires are coming in Monday, and according to Bill I can come by around "dinner time" to pick them up. When Bill said "dinner" it occurred to me that "dinner" might mean something different to him than to me, so, in order to clarify I mentioned I was from Southern California and there dinner was usually in the evening. He replied that "supper" was at night, and dinner was in the middle of the day. Okay, at least I know for sure when I'm supposed to pick them up. I then asked him if he needed my contact information and he replied......"ya'll are the one coming to pick them up, right?" I replied "yes"......he said...."fine, I'll see ya'll Monday around "dinner time". Then I headed over to Tractor Supply......what a cool place.....why don't we have these in Southern California? I needed to buy a replacement 2 5/16" hitch ball. My existing one has acquired a stripped thread making it difficult to compress the split washer, and therefore keeps coming loose, and I don't want the trailer to suddenly take off on its own, so it's time to replace it. I was able to buy a 14,000 lb. rated ball for $13....wow, that's less than half what I have seen them for elsewhere. I also had to buy a replacement 1/2" drive socket wrench as I broke my existing one taking off the lug nuts on the trailer wheels. That 1/2" drive one was only about 10 years old, and I was surprised it failed so soon....I have a 3/8" one I bought in 1971 and I still have it, and it still works great! I got back "home" around 11:45 am and set to work replacing the two front brake assemblies, and it was a piece of cake.......again, way easier than I expected. I'll finish putting the other two on Monday afternoon after I get the front tires back on. Then we'll drop the trailer back on the hitch and load the T'Bird for our lift off Wednesday morning. After that it was time to pick up TLE from her spa day, and then work on fixing the EZup that was damaged in the wind the other day. Fortunately I had a few replacement support arms from the last time it was damaged back in the summer of 2011 when we were still at Rancho Jurupa Regional Park, and it was just a matter of removing the damaged ones, and installing the "new" ones. So, Sunday will be mostly repacking the inside of the trailer so the T'Bird will fit again, and that will be an all morning project.....then it will be NFL time in the afternoon. TLE and I are still trying to adjust to the fact that there is no more Amazon.com work looming out there on Tuesday. The pressure of a self imposed schedule has been excised, and now it is a matter of shedding our nocturnal life style of the past 11 weeks, and going to bed at a normal time. It will probably take a few more days to get back on our normal schedule. As you can see, moi picked 35,563 items over the 11 week stand, averaging 100.7 picks an hour.....that's 1.68 picks per minute, every minute for over 355 hours. Now, I know these are impressive numbers, but move your focus to the next line and see what TLE did over 11 weeks.....41,318 picks, averaging 124.2 picks an hour, or 2.07 pick per minute......she picks like she types......FAST, and she has the numerous Kroger $5 gift cards to prove it!!! So, combined, we picked 76,881 individual items, some of which may have made it directly into your hands. Combined TLE and I walked close to 1,100 miles over 11 weeks to fulfill your Christmas wish lists. 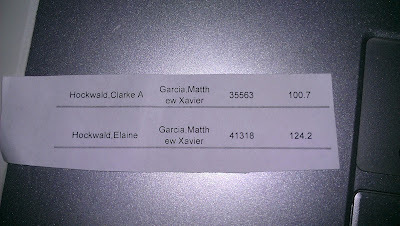 Next to each of our names you will see the name Matthew Garcia. Matthew is a recent graduate of Texas A & M (the school of Johnny "Football", the Heisman Trophy winner this year), and our boss for the duration of our stay at Amazon.com. He is a very personable, accommodating young man, and we were pleased to be able to work for him. Every time I wore my Texas Longhorn t-shirt he had a "fit".....in a playful sort of way, of course. I noticed yesterday afternoon while taking my daily pre-Amazon shower that I no longer have calluses on my feet. All those calluses I have built up over the year of wearing flip flops are gone from wearing shoes 11-12 hours a day for the last 11 weeks. Today I will take a shower and wash off the last remaining vestiges of Amazon.com, and begin the healing process of cleansing my mind of number sequences......no more P-1-A-23-A-48. No more swollen, stiff hands in the morning, no more tired feet, and very little shoe wearing for the next month. Before we did our last "show" the gang met at Happy Days American Grill and Ice Cream Bar around 2:30 pm. We had a great lunch over the span of 90 minutes, and laughed until we cried. Liz and Mike (Mike is the one wearing the Siberian fur hat) told us some great stories.....there is nothing like funny story told with a New Jersey accent. Our last Amazon.com shift ended at 10:15 pm......all the CamperForce, D shift people congregated in a large outdoor tent (heated against the 28 degree temperatures) for our exit paperwork, and debriefing. Afterwards we all convened again at the local Huddle House for an early breakfast.....Huddle House is kind of like Denny's, only not quite as good. Again we laughed, and giggled for a couple of hours. It was so cold yesterday, and last night that our water hose froze for the first time.....even with the insulation I put on it, which served well until this latest weather front came through. Fortunately we have an on board water source and a water pump, so we just switched over to that for the night. Saturday I will pull off the two remaining trailer wheels with the separating tread and get new shoes put on, and then begin to install the new brake assemblies in preparation for our departure the morning of December 26th. The campground is emptying out fast, but fortunately our good friends will be here with us until the 26th. We'll all be going over to Lebannon, KY for Christmas Eve dinner. Right now as I sit here at 7:19 am typing I have three inside heaters going full blast...the outside temperature is 23 right now. The water bay heater has been running all night to keep our fresh and waste water tanks from freezing.....it is definitely time to head south and catch up with the geese who showed better sense than us humans, and left a few weeks ago. It has been a great ride, and it will take a few weeks for us to gain a little perspective on our experience. It was considerably more difficult, at the beginning, than we expected, and we were expecting it to be hard, but we were just not prepared for the initial level of difficulty. Our bodies adapted over a few weeks to the 10-12 hour grind, but it took our minds twice as long to adapt to the level of boredom, and the desire to constantly look at the clock. The old saying "a watched pot never boils" is true......just change it slightly to "a watched clock never moves" and you get the idea. We both remarked yesterday that finally, within the past couple of weeks, our minds had made the adjustment, and the time was passing more quickly. We both lost weight....TLE finally dropped beneath a threshold she hadn't seen for over a year, and I am getting close to mine. Ultimately, though, we have both lost inches around our waistlines and that it the most important thing. And there is no doubt we are both physically in the best shape we have been in a long time. The sun will be rising in a few minutes, and it will be time to finish preparations for lift off next Wednesday. Thursday, oh Thursday......our last full shift.....well, actually Wednesday ended up being our last full shift. Work slowed exponentially Thursday night, and by 2 am we were dismissed.....3.5 hours short of a full shift. Who's complaining? Not me.....not TLE. "It's all over but the shouting" as my father used to say, and the "shouting" will start tonight at 10:45 pm when we clock out for the last time. The weather turned ugly yesterday around 2 pm....the wind came up, and the awning went down just before. I had a premonition that it was time to lower the awning, and within 30 minutes of TLE and I doing just that the wind came up. I don't think it would have survived. Along with the wind came a drop in temperature. By the time we began our walk down the hill to "that building" it was icy cold. I had on my regular winter coat, plus my rain parka with hood, plus watch cap and gloves and was glad for every article of clothing I had on for the short walk. We must have looked funny all bundled up like that, but wearing short pants.....lol! As I sit here composing the latest installment of our Amazon adventures it is 27 degrees at just after 11 am, and there have been snow flurries on and off all night.....none of the snow is sticking, but it is very cold. Additionally, the wind blew out the water heater pilot light, so I had to go outside first thing and relight it.....first thing being 10:30 am when I went to pre-heat our coffee cups and there was only warm water coming out of the tap. During our shift Thursday we spent time saying our farewells to those permanent Amazon employees we have grown close to. All of our CamperForce friends will be here until the 26th like us, so we will have a second round of goodbyes then. One of the things you must take into consideration if you decide you too want to work for Amazon during peak season is that you will leave with many more friends than you arrived with. If you don't want to add to your "friends list" then do not even consider for a moment working at Amazon. Today we will meet at Happy Days Diner downtown around 2:30 pm for lunch with friends and then off to our last half shift (.5) at Amazon.com. Tomorrow we will awake once again retired, once again not subject to the whims and schedules of others. We will return to our natural Nomadic state of being, and moving at our own whim and fancy. When we depart Heartland RV Park next Wednesday morning we will have been stationary for 11 weeks....one week shy of 3 months. In just a very few days we will celebrate 11 months on the road. Wow! A number smaller than 2! Just one more 12 hour shift and then 4.5 hours more Friday night and we are officially RIF'd (reduction in force). Wednesday was very brief for TLE as she slept until afternoon, but I got up around 10am and started to get the inside of the trailer organized so we can load the T'Bird next Tuesday in preparation for our departure Wednesday morning. I'll do a little more Thursday before work, then over the weekend finish it up along with the other trailer related maintenance I outlined yesterday. I then did a little insurance work, and before I knew it the chow bell was ringing. A quick shower later and it was time to get dressed for work.....again! We had sun for a great deal of Wednesday, but as forecast the clouds began to roll in late afternoon. Rain was forecast for 6am Thursday, so we wore our foul weather gear for our walk down the hill to "that building" just in case the rain came early. We were assigned to HRV Wednesday night, which is what we suspected since this is our last week. Jan, our direct supervisor up "there", told us she would try to schedule the CamperForce people more this week. TLE was up there Tuesday night, also. We should also be up there tonight (Thursday). Last night it was HOT up there.....finally around 1 am when they were going to send a few of us down as the work had slowed, I volunteered.....just too hot for me...TLE stayed up until our break at 1:45 am. Both of us spent the remainder of the evening picking on the main floor....me in my favorite Building "C" where it is much, much cooler. Thought I would never cool down. I don't know what is up with that "B" building....it is always so hot in there, but last night took the cake. Usually with all the fans blowing up in HRV I can take the heat, but not even the fans could make it feel cooler last night. I won another "major award"....a $5 Krogers card, and so did TLE. Combined with the Krogers cards we got the night before and last night for working to the end of our shift we now have $30 of Kroger gift cards.....there will probably be some more this evening. Our friends, the McBees, also won Krogers cards so it was a good night for the gang for sure. We got home around 15 minutes to 6am, and just as was forecast, the skies opened up at 6am, and the wind blew. It blew, and rained all "night" (hahaha....morning) with occasional lightning/thunder. The wind wasn't enough to make us take down the awning, but since the forecast is for more wind in the high 20's (mph) for the rest of the day and into tomorrow morning we took it down this morning, since we won't be here again until almost 6 am tomorrow morning. So, here we are......just one more full night of work, then the short shift Friday night and we are free to resume our regularly scheduled programming....."Wandering Nomads"......all new shows beginning 12/26/2012! After the dust settles in a couple of weeks, I'll give you my assessment of our overall experience, and answer the question I have been asked a lot lately....."Would you do it again?" I slept until after 1pm today, and TLE was up a few minutes after me....in just over two hours now we will once again head to "that building", but with lighter hearts knowing this is our last full night of nocturnal wanderings. 5:45 am - Just got home from work at 5:45am....got an e-mail from Jennifer in the CamperForce office notifying us they are changing our last day to Friday at 10:15pm, so we have 2.5 days left, not 4! 10:15 pm is normally our "lunch" time, so we will clock in at 5:30 pm and clock out at 10:15 pm on Friday, and we are done! 11:09 am - Darn, I hate it when I wake up this early after going to bed at 6:45 am! My mind is racing now that I have 1.5 days more than I thought I had to get some necessary projects completed: 1) Install new brakes on trailer, 2) replace the remaining two tires that are starting to show evidence of tread separation, 3) replace the hitch ball. I was concerned that with only part of Sunday, and then Monday (Christmas Eve) it would be hard to get it all done, but now with this extra gift of time it will all get done, and we will be out of here the morning of December 26th and on our way south! Tuesday was the usual day before we go to work. I was up around 10 am....TLE arose at Noon after sleeping for 12 hours! We puttered around, and since the sun was shinning I decided to check the black tank level......it was only at 2/3 full, but we have more rain coming, so why waste a warmish sunny day? We'll dump one more time (Wednesday morning) and then on our way we will be! 4:45 pm came much too quickly, but frankly now that the end is just a few days away I was anxious to get going and get our first shift of the week over with (still thinking at that time we had 5 shifts to go). I seemed to have an extra dose of energy last night as I was moving from pick to pick like a mad man. By the end of the evening I had close to 1,300 picks.....my best night as a "picker" for sure. Of course, when you make that many picks you most assuredly walk a little further than normal, and by 4:30 am my feet were barking, which they have not done for some time. I think I'll just ease back a bit tonight and aim for my usual 1,000 picks, and end up with happier feet. The temperatures were in the low 40's when we exited "that building", but according to Weather.com it will be raining again Thursday, and there is a chance of snow on Friday! It also looks like it may be raining when we leave next Wednesday....nothing I love more than getting ready to leave, and driving in the rain in the coach.....NOT! Well, Wednesday is still a week away.....maybe the forecast will change. At least we will have sun on the weekend this time! Right now the sun is shinning in the drivers side window, and optimism abounds. That's how I feel on our days off. It's like we are holding our breath waiting for the grind to begin again, only this time "the grind" will only be 5 more days. We just got an e-mail from the CamperForce office that on our final shift day (Saturday/Sunday) we will finish at 3am Sunday to attend our shift party and debriefing, however, we will still be paid through 5:30am. If we can swing a couple nights up in HRV that will make this final 5 days even sweeter. We did our Christmas shopping on Amazon....it took about an hour, and now all the presents we bought are on their way to their recipients. With our 10% Amazon employee discount, and free two day shipping the cost is not bad, and we didn't have to get in the car in a driving rain storm to do it. Since we started our Wednesday to Saturday shift Monday always feels like Sunday to me. I always get up thinking it's football day, but then the realization that it is only Monday dawns on me.....:( There was rain during the night, and it actually woke me up one time it was so hard. The rained continued on and off Monday, and then in the afternoon the sky fell for about an hour.....wind, lightning, thunder and torrential rain. Finally around 5:30pm we ventured out to do some shopping when it was clear it had stopped raining. TLE goes through a lot of Sudafed here at Amazon, and in Kentucky in general. Inside "that building" there is a lot of dust in the air from all the fans flowing, and it does affect her unless she takes a Sudafed. I just get a plugged up nose full of dirt. Anyway, getting Sudafed when you are out of state is a major issue since they must run your drivers license to be sure you are not buying it to make drugs. It takes longer to run an out of state license, particularly a California one. This time it took over 10 minutes to get cleared to buy a small box of Sudafed. Speaking of conditions inside the 1 million square foot warehouse aka: "that building", please understand, Amazon does have a crew continually sweeping, and cleaning, but unless you just shut the place down for a real deep cleaning there is no way to get rid off all the dust and dirt. As you climb up stairs to the upper levels of the "PIC MODS" you can look down and see the deep dust accumulation on top of the surfaces below. There are large fans moving air 24/7, so what dust doesn't settle and stick is kept in the air by these fans. The fans are very necessary, but they also contribute to the dust in the air. Inside Amazon you will find hand sanitizers everywhere in addition to cans of Sani-Wipes. TLE and I use the hand sanitzer religiously, and when we pick up our scanners for the day we wipe them down with the Sani-Wipes. Those Sani-Wipes are in big demand, and go fast. In addition we each wear company provided work gloves while picking. If you don't wear gloves your hands will be black with grime at every break. We got home around 7 pm from our shopping excursion, which also involved a run to the County Line to the liquor store to restock. We watched a couple of NCIS episodes, and a couple of American Pickers then went to bed a little after midnight......that is now considered early for us. Thought it would be nice to get up around 9, or 10 and have a longer day before we go to work tonight. 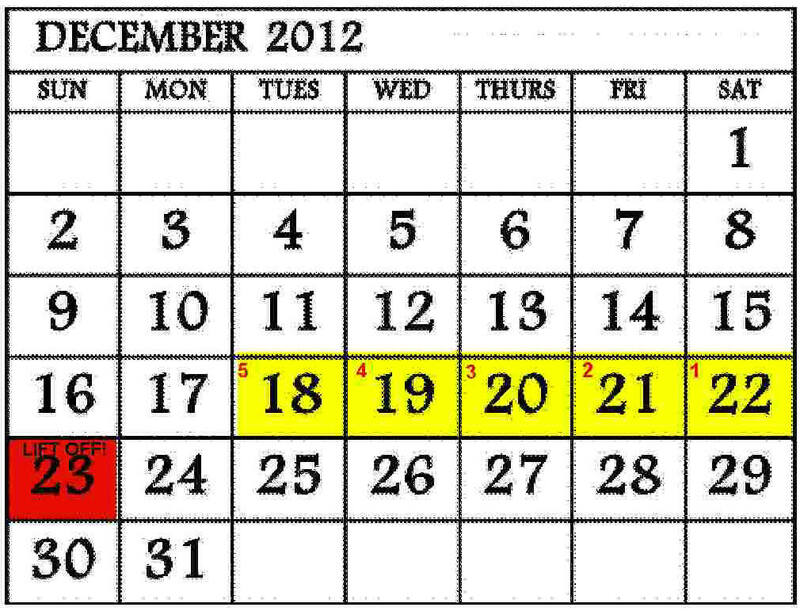 With tomorrow's blog entry the countdown will resume once again. Our time here is now fleeting, and our thoughts are turning once again to the Nomadic life we started last February 1st. This will be our first Christmas away from home, and our kids. Soon we will find ourselves in the more tropical climate of Cedar Key, and then on to untold adventures down the west coast of Florida to the Keys, then back up the east coast to probably Maine before we turn west and recross the Mississippi River. Our plans after Cedar Key are pretty much written in Jello, and our timetable is non existent after Cedar Key, but come along with us and see how it turns out! I had been looking forward to Sunday since last Tuesday when we started our 5 twelve hour days. It did not disappoint. I slept until almost 2pm, and TLE until 2:14pm.....she smelled the coffee and just had to join me before I drank it all! Of course, the NFL games were well underway by that time, but it's all good. I was glad to see Peyton Manning win his 9th game in a row with the Broncos, and happy for my Cowboy friends that the 'Boys once again came from behind to win a close game against the Steelers with a field goal as time expired. Of course the nightcap on NBC between the Pats and 49ers ended up being a great game. The Pats, trailing by 28 points in the 3rd quarter, scored 28 straight points to tie the game late in the 4th quarter only to see the 49ers run the ball back on the ensuing (I've always wanted to use "ensuing" in a sentance) kickoff to inside the 5 yard line where they quickly scored to go back up by 7. They ultimately won by 10. It was a great day to watch the NFL, and a very relaxing day overall. If only I could have 4 days in a row like that.....wait, soon I will have a month of days like that, only it won't be cold and rainy outside.....it will be Cedar Key. Around 7 pm I realized I had not gone outside. Usually I'm outside first thing in the afternoon doing something around the coach, but now it was dark and I had not even unlocked the front door and stepped outside once........so I took out the trash, and then closed the door once again, and locked it again. I loved sitting in my recliner at 4:45pm when we would normally begin our walk down to "that building", and I loved still sitting there at 5:30pm when I would normally turn on my scanner to see where the faceless computer would send me that night. Instead I just sat there enjoying the tingling feeling in the soles of my feet, which meant I was not standing on cold concrete......yay!!! Several naps were taken in my recliner, and around 11pm we turned on Survivor to see who would win, and were totally surprised at the winner, although all of the final 3 were deserving, I never thought it would be Denise, but she certainly played a strong game and deserved the $1 million dollars. After playing such a strong game for 38 days Malcolm made a critical strategic error in not committing to Denise to split the vote and force a tie breaker, which is always making fire, which he would have won handily against Lisa, and, therefore would have been in the final 3. He thought he would win the final immunity challenge, which he didn't, and that sealed his fate. It sprinkled briefly several time during the afternoon and early evening, but the big storm hit around 8am this morning when a torrential rain hit. I slept until almost Noon meaning that I got almost 10 hours of sleep last night. It looks like more rain today into the evening so there goes the trailer brake job I was planning for today. I guess I'll just have to take a few more naps and gird up for the resumption of the countdown beginning tomorrow evening at 5:30pm. Only a week of shopping left before Christmas so get on your computer, log on to Amazon.com and order away.....we are "eagerly" standing by to fill your orders with leg cramps, arthritic elbows, aching feet, blurred vision and dirty knees from kneeling on cold, hard, dirty concrete to pull your special item out of the "A" bin. Don't worry....there are millions of Kindle Fire's left.....I see large crates of them every night on my nocturnal journeys hither and yon through "that building". After Saturday we will spend our time religiously resting, keeping our feet elevated, and resting some more until Tuesday at 5:30pm when we begin our last lap of this marathon. Surprisingly the night seemed to go quickly, which is not usually the case on the fifth day of our work week, however, the last 1.5 hours really dragged by. It seemed like every time I looked at the time on the scanner that only 2 minutes had gone by, but as usual the time to depart "that building" finally arrived and TLE and I, in unison, clocked out a exactly 5:28pm. As we exited the air was heavy with humidity, and compared to every other day this past week it was not cold at all. It was obvious it had been raining on and off during our 12 hour shift. For a change we arrived home without our cheeks burning from the sub freezing temps. We are getting to that part of our stay here where we will begin to say "goodbye" to new friends, and that will be hard to do. I really don't like "goodbyes" at all. There is something about an intense shared experience that bonds people together like nothing else. The good news is we will be seeing these people again....that is the beauty of this lifestyle. It's not like we are going back to Southern California to our sticks and bricks home never to return. We are moving continually, and they are moving, and our paths will cross again. A great example of this is we will be returning to Cedar Key shortly to reconnect with friends we made in our brief stop there last March. All of us who crossed paths briefly have been working to reconnecting there again. So, I know our paths will cross again over the coming years, and that takes away a little of the pain. TLE just returned from the land of the living dead at 2:14pm.....a new world record! Now it's time to sit back and watch some NFL......thanks for stopping by! It will be but a few more days that "that building" (deep background) will be visible to our naked eyes. It will only be a fading memory filled with the hardest work I have ever done, interspersed with a lot of laughter, with new friends. Friends who have become such an integral part of my daily life that I am finding it difficult to imagine my life, in just a few short days, without. It has been physically demanding, but most of all mentally demanding. It may seem like "grunt" work to some, but in reality it takes 10-12 hours of almost continual concentration while standing/walking on your feet a great deal of the time on cold concrete. You will climb up and down 4 flights of stairs often. As Katie, an Amazon associate, says "this is my gym membership", which includes a treadmill (walking 10 miles per shift), a stairmaster (up and down 4 flights of stairs), and often involves squats (got to peer into that "A" bin at floor level) and curls with (picking up the loaded totes and placing them on the conveyor belt) varying weight loads up to 40 pounds. Personally I have lost around 8 pounds, and am now fit enough to hike the Appalachian Trail (end to end about 4,000 miles) if I wanted to, which I don't, but you get the idea. I think TLE has lost 1, or 2 more than I have. Friday was another day in the "eat, sleep, work.....repeat" mode we have been in lately. Arise around 1 to 2pm.....enjoy a couple of cups of coffee then start to get ready for work. Of course, now that we are so close to the end of our work contract we think and talk more often about our life after Amazon, and, as I walk the concrete corridors of Amazon.com, my mind often drifts to thoughts of changing scenery, sunny beaches, tiki bars, micro breweries, bike rides, kayaking, flip flops, t-shirts and shorts......in short, all the things currently missing from my life. TLE and I were blessed to be called up to HRV last night for our full shift. We love being up there late in the week when the time on the "floor" seems to slow down. In HRV time speeds up, and our tasks become more varied......pick a little, pack a little, talk a little, restock a little, clean up a little.....repeat. And to top it off we work in HRV with neat people....Jan, Kim, Roy, Cameron. I am amazed at their upbeat, positive attitudes. This is their full time job that they work week in and week out. These are the kind of people who impress me, because I don't know if I could do this work for years on end. I am glad to have met them, and to have gotten to know them. They work hard for their paychecks, and do it with a cheerful attitude, and they are grateful to be employed. The forecast is for a chance of rain......well, I heard the chance of rain on our roof about an hour ago, and it does look like more on the way. One more day left in this current work week, then 2 days off, and then 5, 4, 3, 2, 1 lift off! I am not looking forward to putting everything away that I have taken out over the past 10 weeks. It's good that we'll have 3 days to sort, and repack everything before we head to Chattanooga, TN for our coach servicing. I'm not looking forward to that, but the process will be all the more pleasant because of what it means. We are fast approaching the end of our 11 month on the road.....it's hard to remember our life before February 1st, because this is now our life. I can't imagine us doing anything different, and we have just barely begun our new journey. Sometime in the near future we will be doing some remodeling of our home on wheels.....the sofa bed couch will be removed, and replaced with another Euro style recliner and a desk area. And sometime in the very, very near future I will be sitting in my beach chair with my feet in the warm Gulf waters sipping a mirco brew NOT thinking about my next pick.....that Kindle White Paper located on a pallet in R-3-H-23-A-1.